Although CoffeeCup Free Viewer Plus has several nice built-in utilities, it also has a few issues that could be frustrating for some users. We'll take a look at both the good and the bad in this review. CoffeeCup has an excellent reputation in the web design industry of developing simple, straightforward tools that are easy to use and reasonably priced. In fact, a few of the company's products – like Free Viewer Plus – are completely free and only require a simple download and installation to start using. Of course, CoffeeCup is most likely hoping that you'll be so impressed with the free tools that you'll consider purchasing some of the more robust, paid software products developed by the company. But, there's nothing at all wrong with that. In fact, it's a rather nice business model and it gives potential customers a chance to try out software without any obligations or expenses. 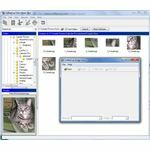 As its name suggests, Free Viewer Plus is a free photo and image viewer for the Windows operating system that has some nice added capabilities, such as built-in ZIP and FTP tools and an image slicer that lets you break up large images for faster web page handling. This review will take a close look at these and other features found in Free Viewer Plus. Free Viewer Plus may not have a fancy Web 2.0 interface, but that may be a blessing for those looking for a simple, easy to navigate tool. Icons for commonly performed tasks can be found on the main toolbar, and additional commands can easily be located through the application's menu structure. Double-clicking on any thumbnail in the preview pane will open a new window with a full-size view of the photo. In this new window, you can perform several basic editing functions, such as cropping, resizing, and rotating. All in all, the interface is very intuitive and it shouldn't take you long at all to become comfortable with the software. The one downside of Free Viewer Plus is that it is a bit on the slow side when it comes to loading the thumbnails for a newly selected folder. If that folder only has a few small images, it can take several moments for the software to scan the folder's contents and display them in the thumbnail preview area. If a folder has many larger photos, this process takes even longer. On the other hand, the Image Slicer is a very handy tool, although it may take a couple of tries to get the hang of how to use it. With this utility, you can cut up large photos into smaller, more manageable pieces and then reconstruct the entire image on a web page. This can be very helpful when trying to reduce web page load times. 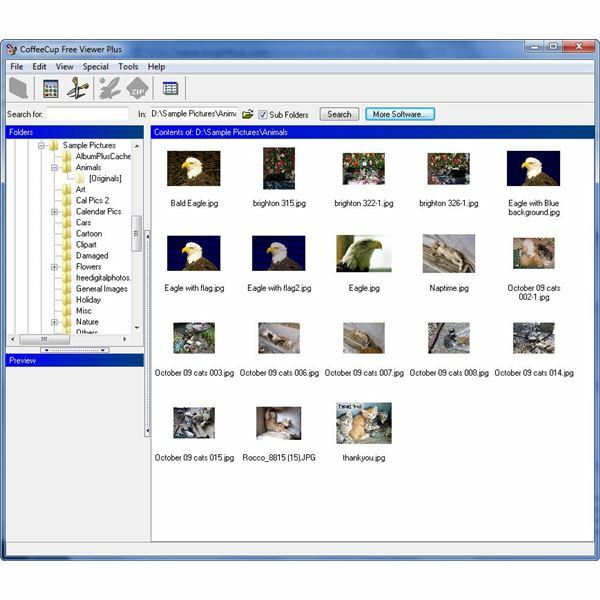 In addition, Free Viewer Plus includes built-in utilities that allow you to ZIP and FTP photos, making it easier to email your photos or transfer them to a host server. 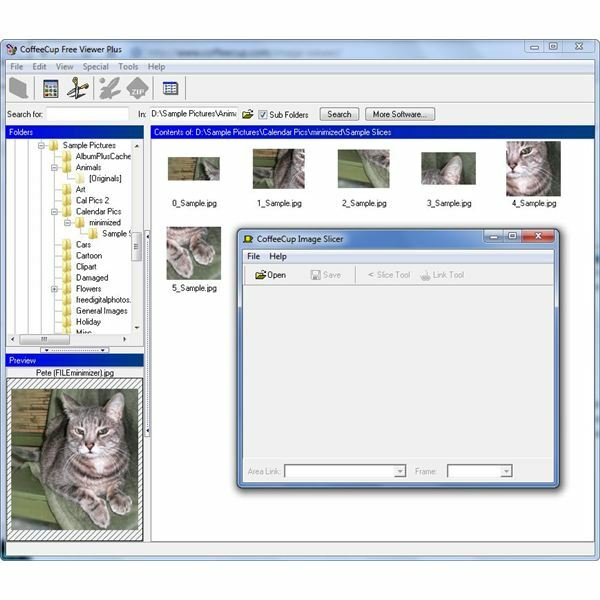 The software also includes a thumbnail wizard that walks you through the process, step by step, of creating an HTML thumbnail photo gallery. Even though there are "nag" windows that urge you to buy other software products from CoffeeCup both when you open Free Viewer Plus and when you close it, the application is still completely free. It's not a trial version or shareware – that is, there are no hidden strings attached. The advertising reminders themselves aren't even that annoying. There are no timers that make you wait a certain length of time before continuing, and you can proceed to the application from the advertisement with a single click. Besides, CoffeeCup offers a number of great products at extremely reasonable prices (including other free applications), so it's nice to check out the company's site from time to time to browse through the new releases and upgrades. Despite the slow thumbnail loading times that occur every time you switch to a new folder, Free Viewer Plus is quite a nice little utility. 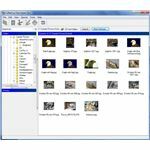 It's particularly useful for those looking for a photo viewer to use as an aid in web design or to help with the transfer of images to a remote server. And, if you're trying to stick to a budget, you certainly can't beat this application's price.